A couple of new promotions aiming to get you to spend more on video games, have just been announced. 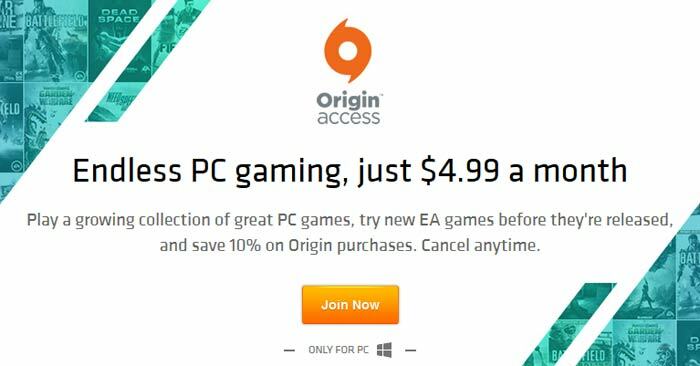 EA has announced a new subscription-based service for PC gamers called Origin Access costing £3.99/$4.99/€3.99pm. Alternatively, if you are more interested in physical game releases, across platforms, then Amazon's latest Prime enticement gives 20 per cent off newly released (within 2 weeks) and upcoming games to subscribers (US only for now). As noted by Polygon, some subscription features don't seem to have carried through from the Xbox One equivalent service, most significantly there is no discount annual subscription offered at this time. It would also make sense for EA to offer a discount for subscribers to both the Xbox One and PC services. At the time of writing The Vault includes titles such as Dragon Age: Inquisition, Battlefield 4 and Plants vs. Zombies: Garden Warfare - and will feature third party titles. Origin Access is available in the US, Canada, Germany and the UK and costs $4.99/€3.99/£3.99pm. More countries will receive the service soon. Amazon continues to enhance its Prime subscription offering to make it more attractive to end users. The latest announcement, which appears to cover the US only, for now, is a 20 per cent discount on newly released and pre-order games, across formats. The discount will only apply to physical copies of the games. Amazon Prime costs $99pa in the US. Good deal, will be great if they start doing annual and cross-platform subs too. So pay monthly to give EA slightly less money than you would otherwise. And its probably cancelled out by the fact you have to pay monthly. The cheapest I've managed to find the basic version of Dragon Age: Inquisition is about £10-12 pounds. So, that would be three months worth of Origin Access before paying monthly costs me more than buying seperately so I disagree that it's slightly less than you would otherwise. And that's just one of the 15 games in the vault. Some of them are dirt cheap now but the newwer battlefield titles aren't, if you're interested in that kind of thing. There's a point in that you don't own the games so once you stop paying the games are gone. I think it dfepends on your gaming habits. I rarely revist things these days (too many new things that take my attention) so even just getting it for one month to play Inquisition would be a cracking deal for me. For people who go back to things again and again, perhaps not so much, depends on many other titles you would be likley to play. I think, like most subscription services, its incredibly dependant on what you use and how often you use it. Several years ago, I would never have considered something like netflix or an amazon prime account for videos, tv, books etc. to be worthwhile for me. Having picked up a free six months of amazon prime as a student and seeing the huge range that's available, I'm rethinking slightly. I liked the idea of the EA access on XBone, although I don't have one, so I could potentially be swayed by Origin Access. Amazon Prime is beginning to tempt me more and more. I tried a free trial over Christmas and really enjoyed the next day delivery and Amazon music. Considering how much I watch on Netflix I'm sure I'd find something on Amazon-Instant-Love-Video-Film-Whatever-it's-called-now to watch. That said, I rarely buy physical copies of games anymore, and I'm even less likely to buy it around release day. I still don't buy PC games. You just can't resell them and get back 90% of the money back like console games.